In the last 10 years, prominent national scholars and experts, as well as a group of more than 100 students from a local primary school wrote to Beijing city leaders, requesting a halt to the ongoing destruction of Beijing's historical heritage Hutong, the narrow alleyways and small courtyard houses. For them, land development was rather an issue of protecting culture. Today, it turns out to be a human rights issue for those who are forced to move out. As the 2008 Olympic Games approach, more Hutong disappear, and are turned into high-end mansions, modern-looking business centers and shopping malls. Residents of Hutong get driven out of the homes they have lived in for generations, and have to head towards the suburbs, as the compensation offered is too little to stay nearby. Those who resist, or attempt to take legal action run the risk of harassment including visits by gangs. Chinese law, in theory, protects property rights of residents, but in practice, is not functioning. In late April 2002, when Mr.Liu Fengchi, a 74-year-old retired public servant residing in a Hutong area in the city's central Chongwen district decided to confront the local authority, he could never have imagined that the legal system in China was so immature. 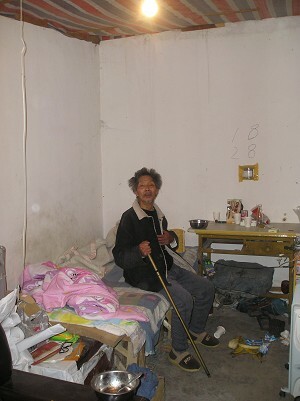 Liu and his family lived at Chongcikou Dongxiang-13. Liu's mother was a descendent of royalty of the Qing dynasty which lasted until 1912, and therefor the Liu family was from the wealthy side of society. The 138 rooms he inherited from his father were taken away by the communist party in the '70s, but a small portion was returned to the Lius in the early '80s. Lately, the entire block become a part of the area that would be redeveloped under the guise of scrapping old buildings with safety problems. Liu's wife Li Xiuyun recalls that no official announcements were made, and no public hearings were held for the thousands of residents living nearby. On or around April 20th 2002, suddenly the eviction notice came, instructing them to leave within 15 days. Then roughly 10 days later, the removal company came with bulldozers, and started smashing down the residences. Having their rooms transformed to rubble, the Lius had no place to go. They built walls in the middle of the open land, to protect themselves from the rain and wind. The roof was made of vinyl sheets. The family, as well as their relatives, made an appeal to the local land and control office for adequate compensation, claiming that they owned 138 rooms, as shown on the title deeds issued in the Republican era, before the communists seized power. On October 7th 2002, the land control office ruled that the Lius owned 10.5 rooms or a 163.3 square meter of land only, and would be entitled either to compensation of a total of RMB1,064,395, or the privilege of purchasing 4 apartments with 3 bedrooms built by the land developer for a price not yet known. Liu, not satisfied with the ruling, filed a lawsuit at the local court, demanding clarification of the ownership of the entire 138 rooms. On July 31st 2003, the court judged the ruling of the land and control office illegal, as the land and control office had demolished the land before clarifying the ownership. On the same day, the spokesman for the local land and control office announced they were conducting an investigation into the land's ownership, but in an interview on December 30th 2006, Li said that they had heard nothing from the local government since that date, three years ago. The Lius have experienced various forms of harassment during this process. One day a dozen huge snakes were thrown into their home. Mobs hang around outside their home. Threatening phone calls are frequent. Groups of people place piles of garbage in front of their rooms. Some come on trucks displaying the name of local government units, and some look like restaurant employees. On September 3rd 2006 at approximately 10:00PM, as a group came and started dumping garbage as usual, Li walked up and asked them to stop. A man they called “boss” appeared a moment later, and beat Li so badly that she suffered a broken wrist and ankle. Later on, a police officer phoned Li and explained that “the man has a mental disorder”. Li now suspects that the crime of the authority is much deeper than they had expected. 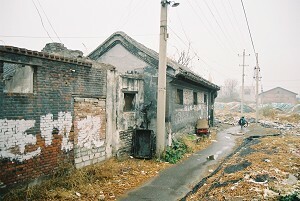 Replying to an enquiry that Li had recently made, the planning division of the Beijing authority explained that a “plan” never existed to develop the area between April 2002 and August 2003, when the houses were knocked down. “I now believe that the land developer, together with the local authority, made up a fake development plan based on nothing”, says Li. The Lius have nothing left apart from the property certificate, and the hut, their temporary home with cracks and holes. Their residence could be knocked down at any moment, but “the authority is maintaining complete silence” says Li. When asked for his plans, old man Liu shouted angrily “I'm not afraid of anything. We will carry on fighting until we get back our property!!”. Does the government protect the people, or the interest of land developers? Ms.Miao Weirong, currently a Tokyo citizen with Chinese nationality, had spent 9 years in Japan when she heard from a local friend in Summer of 2001 that her home in Beijing was likely to be demolished under the newly enacted government policy. In October 2001, Miao flew to Beijing, to clarify, and then handle the situation. By the time Miao returned home, notices issued by the authority had already come off the walls. Neither the authority nor the land developer contacted Miao to offer her an opportunity to discuss the details of the removal. At the end of 2001, the campaign to drive out the residents was activated. Strangers started to hang about the neighbourhood, and people began to receive threatening phone calls. The longer they stayed, the extent of the harassment escalated. “One day in February 2002, I came back home late to find the light bulbs smashed, phone line disconnected.”. “Threatening calls came in every day. Mind you, they don't take holidays on Saturday and Sunday” recalls Miao. Miao originally owned two properties, one belonging to her, and another belonging to herself and her family members, but she decided to fight for a 17.4 square meter parcel of land, which was a part of the latter. On June 22nd 2002, the local land and control office delivered a “ruling” to Miao, demanding her to leave the land, and to complete the administration involved in the choice she would make, within 2 days. The land developer's offer notified by document was either (1)the privilege to buy a single room mansion in the developer's new building, plus a compensation of RMB13,000, or (2)a farewell cash payment of roughly RMB135,000. The author looked into sina.com.cn, one of the most popular search engines, to search for a new single room, but the cheapest room available in Chongwen district was RMB350,000 at the time this article was written. Suppose the new room prepared by the developer is of the same value, then after deducting the RMB13,000-worth-compensation, Miao will still need to pay RMB337,000. 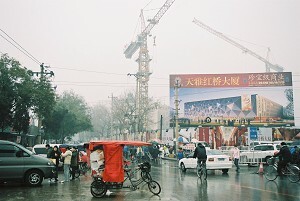 The average disposable income of urban Beijing residents was RMB1,470 per month in 2005 according to the Chinese government statistics team. Provided the entire RMB1,470 income is put in to pay off the debt, it would still take 20 years to buy one room. On June 28th 2002, the local government delivered its letter to Miao, ordering Miao to vacate by July 2nd 2002. On July 1st 2002, Miao paid a visit to Beijing Chongwen Xinshijie FangdiChan Fazhan Youxian Gongsi, the land developer, to discuss the matter. When she returned, her home had already gone. Miao could have filed a case with the court, as Liu did, but did not. “I learnt as I went through the process, having talks with the local authority and the land developer, witnessing scenes of demolition, exchanging ideas with other victims, that the local government, the developer, the removal company are all interconnected, either by human connection or money. There is no way we can win!” say Miao. In September 2003, a desperate Miao wrote to national leaders prime minister Wen Jiabao and the Chinese President Hu Jintao, as well as ruling bodies such as the National People's Congress, and the Communist Party's Discipline Inspection Committee. She even wrote to the headquarters of the land developer in H.K., only to gain hostility from its branch in Beijing. In her letter to the Chinese prime minister, Miao asks Wen Jiabao, “how can the land developer force me to sell my house for this unreasonably low price?”, “after all, is the government protecting the right of common people, or the interest of land developers?”. The letter never received a reply. Miao even contacted a dozen local lawyers, but none were willing to provide support. Although the Chinese regime emphasizes that the nation is governed by law, the reality is the contrary. 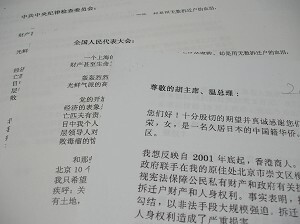 In a government-organized conference held in May 2005 in Shanghai, Mr.Duan Zhengkun, the vice Minister of the Justice department stressed that law should serve the goal of politics, to an audience consisting of hundreds of local lawyers and authority reps.
“The government fears emergence of ambitious and capable lawyers challenging the government, and up-grading the local issues to national scale issues.” says a Shanghai based lawyer who attended the meeting. “Mr.Duan stated clearly, in the case of politically sensitive cases being brought into law firms, they need to be reported immediately to the authority. Then the authority will decide which lawyer defends them, not the law firm.”. Dozens of lawyers immediately left the room after hearing Mr.Duan's statement, says the lawyer. On July 6th 2005, Miao visited the land developer to negotiate. 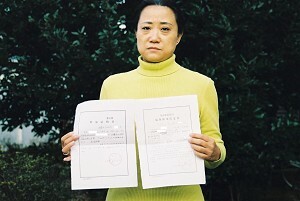 The developer suggested that there was a possibility of Miao receiving a better offer, provided she submit a signed letter stating that the reason Miao and her husband protested demolition of their homes, and made political action was an outcome of being deceived by Japanese right wing activists, and that their economic situation was desperate. Miao did not trust the developer's word, as she knew so many cases in which innocent people who had submitted such letters were deceived taken in. She rejected the land developer's offer, and left their office. The next day, on 7th of July, Miao was detained by the police for the first time in her life. On July 7th, Miao and her friend, met another friend at Shanfancun, a street where political appealers gather from rural China, in order to receive a memory stick, containing photos, documents, and voice records that prove the wrongdoings of the government and the parties involved, in relation to the property issue. They purchased two documents for a total of RMB2.00, equivalent to US$0.30, which they believed would help their cause. As they left Shanfancun, they realized that their taxi was surrounded by 5-6 sedan cars. Men in white shirts and black trousers, some of them with sunglasses, rushed out of the cars. One of them shouted “Under arrest! !”, and the three were pushed into cars separately. None of the men wore police uniforms, none of the cars had number plates. Miao was taken to Beijing Xinbeiqiao police office, and stayed there for 14 and a half hours on suspicion of illegally possessing classified documents, until 5.30AM. When released, Miao refused to sign the official record, as she believed that being held for more than 12 hours was illegal. The 30 cent documents, described as classified by the police, are believed to be publicly available. At 1.00 AM, when Miao and her friends were still being held by the police, about 10 men came to Miao's mother's apartment, where Miao was temporarily staying, and conducted a search. After embarrassing the old woman by even rifling through her underwear, the men left empty-handed. However, the memory stick had fallen into the hands of the police by then, and that became an excuse to detain Miao for a longer period. Miao returned home early in the morning, only to get taken away again soon after. Around 17.00 that day, as Miao was being interviewed by a reporter from a foreign media, a dozen men broke in again, took away Miao, leaving behind a piece of paper stating that Miao is now in custody for illegally handling national secrets. Miao was taken to Beijing 7th Prison, given a towel measuring 30cm X 30cm, and spent 4 weeks watching education videos such as “how to live a new life as a human being”. After being released, a furious Miao continued visiting the developer. One time, a member of the developer swore, “You carry on until we lose. We'll carry on until you die.” Miao could not visit any government body, as making a political protest officially may lead to arrest. Miao now recalls – Those who protest, go through harsh times receiving various kind of threats. Gangsters pay visits, smash windows, take away walls and roofs, and destroy toilets. Those tough enough to fight back and say “you use mobs, then I use mobs!”, end up being offered better places and more rooms, but not all of the residents are that brave. Elderly women living alone, or families with a single mother are most vulnerable and receive the smallest amount of cash as they are evicted. Money talks too much in China, in the most influential Communist regime remaining in the world. The wealth created there is not equally distributed among the vast majority of people, and those in control of power, monopolize the output of the national production. Crony Communism is a lot worse than crony Capitalism, as it lacks democracy, and fails to monitor the evil committed by the regime and those in power. The Chinese version of “inclosure”, through which land developers drive farmers from the land at a very low cost, earn big profits by building industrial parks and commercial zones, and provide kick-backs to government officials, is a common money-making mechanism that prevails nationwide. 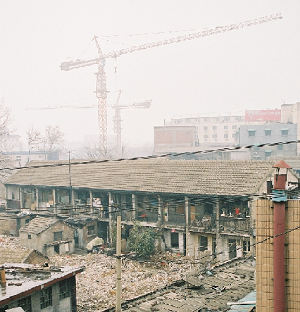 On June 11th 2005, in Shengyou, a village in Hubei province in Northern China, a group of 200 to 300 mobsters hired by the local construction industry, attacked farmers who resisted eviction, leaving several dead, and dozens with serious injuries. The incident was accidentally video taped, and was broadcast by the Western media, but such cases are the tip of the iceberg. The present Wen and Hu administration talks tough about bringing justice to the nation, and have even brought some local authority figures to court, but has been unable to conqer the moneylust of businesses and local bureaucrats. Ms.Ni Yulan, a Beijing based lawyer who also confronted the authority after her house was demolished, points out that while more than 90% of the land in the city of Beijing has fallen into government hands, 99% of the farms in the suburbs have disappeared under government leadership. “My husband used to ask me, can't I just forget about the small piece of land, get rid of all the mess?” says Miao. “Still, when I am reminded of those people who suffered a lot, the elderly woman who got beaten badly by the mobs, I feel I should not give up. I really need to voice the truth”. Despite having put in a lot more money than they can ever recoup, Mr.Shen, Miao's husband said that he fully supports his wife's activity. “What makes me extremely concerned is that the facts are not well known to the rest of the world” says Miao. “Those who have hold of money, have hold of power. They bully innocent people, by using the Olympic project, and chase them out of the houses they have stayed in for decades”. “Is making money at the expense of the right of common people to live a quiet life, what the Olympic games is all about? The Olympic games should not belong only to the rich or the people in power. It also needs to bring a better life to the poor and the weak”. 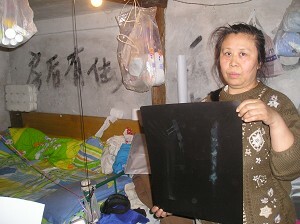 What remains in Miao's hand is a piece of paper showing her ownership of a small portion of land in downtown Beijing. The house is gone, the land is gone, and the community is gone. Even her life in Beijing is gone, as it looks too dangerous for her to return. Despite those experiences Miao is determined to carry on fighting.